I have never been a big fan of watermelon, and was asked to bring some to a summer bbq. What could I make with watermelon that would be different? I remember trying this delicious salad last summer with yellow tomatoes, watermelon, basil and feta, and thought what a great combo. I loved the saltiness and sweet together. I made a different version of that salad with ricotta salata (a dry, mild cheese, that resembles feta) and mint from my garden. I made a light dressing with honey, lime, red wine vinegar and lime zest and it was terrific. I will be bringing this salad to every summer picnic from now on. 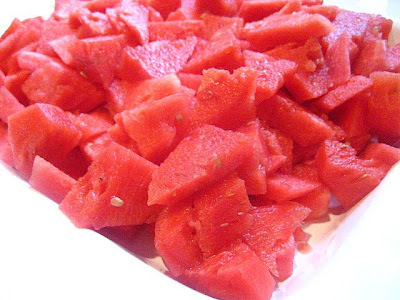 Arrange your watermelon pieces in a large bowl. Add your dressing and mix lightly. Add mint leaves and ricotta salata cheese. Love those ingredients together! Yum! What a perfect combo! I've made a salad with heirloom tomatoes, watermelon, feta, and mint before for my clients and they raved. What a great idea, and pretty colors. I'd love this with feta! I love watermelon, thanks for sharing the recipe. I am building a cookbook with summer recipes and this will definitely be added. Thanks. What a neat combo- love it! 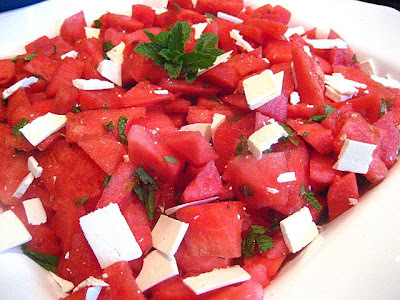 I havne't tried one of these sweet/savory watermelon dishes yet, I definitely want to. This looks so pretty! Looks good... I made something similar a few weeks ago. 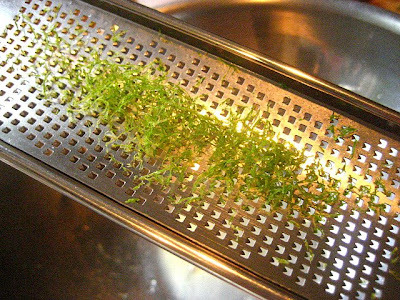 Makes a nice summer salad. How refreshing and what great flavors! I can see why it was a huge hit! Yum.. I love mixing watermelon with savory ingredients in a salad. I did a nice one a year ago that had red onion and...well Ican't remember, but it was really good. I love this. I have found a patch of swampland at my barn that has mint growing so abundantly that you can smell it from the road. I find this a boon and I am looking for plenty of new ways to use it. I have an obsession with watermelon. I could eat a whole one! It is my favorite summer dinner. I will have to try it this way. Looks so good!! My mouth is watering now! Good thing we have one in the fridge! Hope you had a GREAT time out east. The weekend weather made for the rained soaked week. I'm in PA!!! I just checked my notes. July is National Watermelon Month. I'll be saving this link! I have to admit I'm not a fan of watermelon either. However, I have a gigantic whole watermelon sitting on my counter that was leftover from a brunch I hosted last week. I have had no idea what to do with it. I really like your idea of adding the ricotta and red wine vinegar. This is a taste combo I haven't ever tried. I like all of those ingredients, so I have to give it a go. I love the mint addition especially. It looks so refreshing. 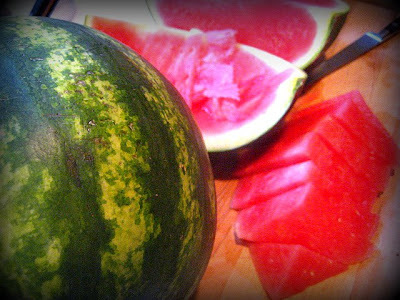 This combo was on my to make list for the summer, (we love watermelon! )but I was going to use feta, hmmm, I may have to try ricotta salada instead. Great idea! Love this salty sweet combination! 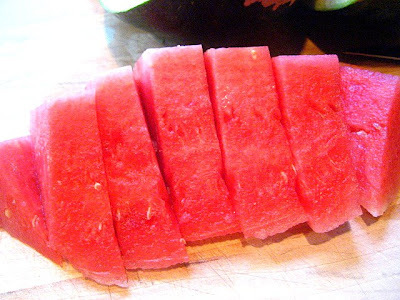 I love watermelon this way and what also works well is raspberry vinegar as well. It gives a good layer of flavor.